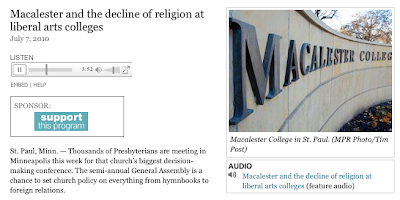 UMP | University of Minnesota Press Blog: Jeanne Halgren Kilde reveals how Macalester College's religious connections have changed. Jeanne Halgren Kilde reveals how Macalester College's religious connections have changed. Last week Jeanne Halgren Kilde, director of religious studies at the University of Minnesota, interviewed with MPR with regard to the U.S. Presbyterian Church's largest decision-making meeting last week, which was held in Minneapolis. One little-known Minnesota trivia fact: Macalester College, one of the state's most prominent liberal arts colleges, was founded by a Presbyterian minister in 1874. It has since shed much of its connections to the church, not unlike other liberal arts colleges in Minnesota, as MPR notes.